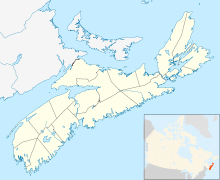 Fox Harbour Airport (TC LID: CFH4) is a privately owned airport located 1.5 nautical miles (2.8 km; 1.7 mi) north of Fox Harbour, Nova Scotia, Canada on the shore of Northumberland Strait. It was built as part of the Fox Harb'r Resort, owned by Ron Joyce. After completion of the airport, the nearby Tatamagouche Airport, located adjacent to one of the Tim Hortons children's camps and also owned by Ron Joyce, was closed. A crash on November 11, 2007 at the airport destroyed a Bombardier Global 5000 private jet and seriously injured five people including the airport's owner Ron Joyce. An investigation by the Canadian Transportation Safety Board in 2009 blamed a landing approach system that was unsuitable for high-performance jets, a road at the end of the runway that was a significant hazard and "seat of the pants" landing procedures at the airport. This article about an airport in Nova Scotia is a stub. You can help Wikipedia by expanding it. This page was last edited on 8 April 2018, at 01:41 (UTC).